Today was one of those days that was an unexpectedly awesome. You know..... one of those that seems to be just an ordinary day when you wake up. But when your climbing into bed later that night, you stop and think, today was a pretty good day. *Our ac finally got fixed after almost two weeks of being out in 90 degree weather. *We had a family breakfast date. *We got a text from our friends who are expecting their 3rd child this fall, that it's a GIRL after having two little boys. I can assure you there was lots of screaming in the car when we got it! 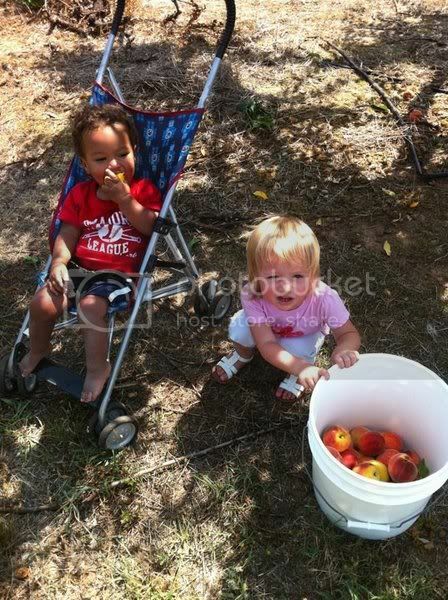 *We took the littlest two out to pick peaches and even though we goofed and took them at the hottest part of the day, they were troopers and seemed to have a good time. *I went grocery shopping at my favorite grocery store with one of my best friends. I can say I've never done that before and it was actually pretty fun. So much so, we think we'll do it again. *After grocery shopping, we went back to Nicoles and put those two little ones down for naps. 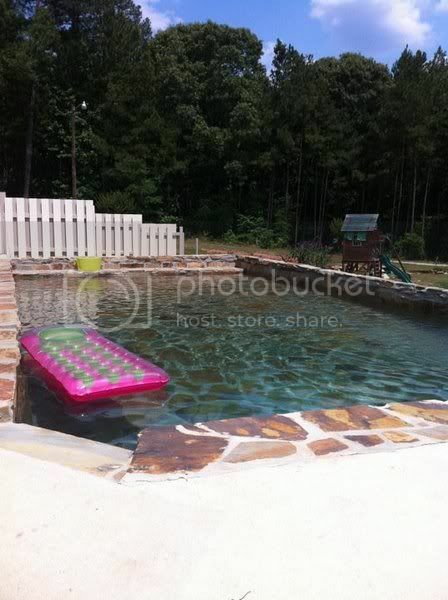 We then proceeded to lay out in the pool for TWO full hours!!! We weren't splashed once, we didn't have kids hanging all over us, we didn't have to hear "watch me, mommy!" a hundred times, we didn't have to yell "walk" to little blond girls that are always running around the pool. We even had a full two hours of uninterrupted conversation. It was Mommy Heaven!!! The only thing missing was a cabana boy and some frozen drinks. *Olivia went #2 in the potty. I know some might be rolling your eyes right now, but when your the parent of a small child, that's big exciting stuff!!! No, we're not officially potty training, but it's obvious she's ready or close to. Our schedule has been so crazy busy lately, I'm waiting for it to calm down so we can really focus. I'm thinking it's going to be closer to the end of summer. So, that's a few of the little things that made my Monday pretty awesome. yay for an awesome monday! !